Please note: We are currently updating the book. There are still areas undone. You may find redundency or other confusing terminology that has yet to be corrected or made more concise..
We expect to be finished by early May but at this point we have updated enough to make it worth rushing the update and re-do. What light is and how it works. Seemingly thee most mysterious of the phenomenons out there. But it’s not mysterious at all. Here is a complete and detailed description of light. The facts are solid. Everything we put forth is already proven physics. What we present here answers all the questions. And not just of light itself. First, here is what is currently known and/or believed. And here are its paradoxes. Light measures 'c' whatever speed or direction you or it’s source are moving. ?? Light appears to be a particle at times and a wave at other times. ?? Light ‘photons’ are said to be mass-less but can be deflected by gravity. ?? And it is also said that the particle and wave characteristic is of a dual nature. Meaning that ‘photons’ are both a particle and a wave at the very same time. This did not compute. There had to be a better explanation. And there is...! First of all we do not believe that photons actually exist. At least as they are said to be involved in the production of light. They are an imagined explanation that Newton came up with 400 years ago. He called them corpuscles then but they were more recently renamed photons, apparently to make them appear more legitimate. Photons are said to be single frequency tiny bits of nothing that always seem to produce white light in those single photon experiments I've seen done... ?? They also say photons know enough to line up in the right frequency order and amplitude to reproduce a digital version of the entire analog EM spectrum. ?? So if they existed they would be there for the *entire* spectrum, not just the visible. The cosmos wouldn’t have known the frequencies our evolution would have chosen for us to see by. But for now we’ll just look at the visible light spectrum..
And yes. Least we forget.. Photons are supposed to have the amazing feat of non-science (nonsence) ‘Duality’... Their ability to be a massless wave and a particle with mass at the same time. Also to be in two places at once, and to hide when someone is watching them. It is what I call the precursor to light. Instead of photons, light is brought to us by real life *electrons*. Yup. They have been proven to fulfill every feature and fact we have observed about light. They are the long suspected particle portion of light’s delivery and creation.. They have the mass that can be and is diverted by outside gravity sources, and that mass is also the weight that can move things ‘light’ hits. It is the particle, with mass, that produces the massless ‘pilot’ wave. With absolutely and positively no duality. The concept of duality is dumb. Electrons are ‘precursors’ to light because they do not ‘produce’ visible light themselves. But they do cause it to be created on whatever surface they happen to hit. There is no light between any source and the surfaces it illuminates. The facts that point to this are items like the the sky being black at night, and that they need to add mist to the air to supply the surfaces to hold a light show. No mist, no light show. You can prove this yourself by bringing a flashlight into a dark room and shining it on the wall. You will see the light coming at you from the wall but you will not see the beam that is making it happen. It is the electron’s pilot wave that comes to produce the spectrum that we use to see by. For now we’ll say the high end of that spectrum in most cases usually starts just above the ‘visible’ wavelengths to all those below. Infra red, microwave and all the lower radio wavelengths. But it is only the high end of this spectrum that has the wavelengths short enough to match the size of the molecules of most surfaces to react to. According to a surface’s consistency and molecule sizes, they will reflect, refract, filter, prism, absorb, block, or pass through the waves that are laid on them. And when we look directly at a light source they are spread out on the eyeballs, thence to our retinas. Start with the idea of a radio transmitter being stationary and radiating its particular EM frequencies outward at the speed of light..
Now imagine that radio transmitter moving at 1/2 'c'. It's forward going wave will be blue shifted to twice the transmitted frequency. And it's trailing wave would red shift to one half the output frequency. All others would have the blue or red shifted wavelengths, including the middle not shifted wavelength, as determined by their particular outward angle from the transmitter’s forward direction..
Now visualize the transmitter traveling at the speed of light. I know nothing can but just pretend. As what.? White noise of course. :) That which is thought to be the remnants of the big bang. :/ But it’s not. White noise is all those other angles of blue shifted pilot frequencies that went beond the limits of visible. Brought to us not as point source of visible light but as a smeared and combined mix of interference patterns. But looking forward again.., just outward from the forward line of travel the circular wave fronts will, degree by degree, become longer as the blue shifting lessens. This continuous lengthening produces an *infinite* electromagnetic spectrum, to be laid down on any surface the photon hits. From the ultimate highest frequency cycles or hertz possible to the lowest that which may well be cosmos long. But since our cave days, science has developed devices that can see above and below what we know as visible light. Because it’s really all the same thing... Science is searching the cosmos using it's x-rays and microwaves. And as above, those frequencies are brought to us by precursor electrons too. It does have a constant speed but not as it’s thought to hapen..
It’s commonly accepted that if you were to shine a light toward the nose of a space ship traveling at one half 'c', light would measure 'c'. And if you were to shine a light to the rear of that space ship traveling forward at one half 'c', the light would measure 'c' again. Sounds impossible..? Yes it does. But it's obviously possible because we are on the space ship earth. And we are traveling through the cosmos pretty fast ourselves. And likewise, it applies in every case where light is seen by eyes or measured by devices while traveling at any speed through the cosmos. What is happening in truth..? Lightwaves are propogated across your living room or the cosmos equally at whatever speed it is... We measure it as ‘c’ but that’s only our measurement from earths POV. It does however have a constant speed. But that is not what we think it is. We believe it is the light that changes velocity as we go into different speeds and directions so that it is always ‘c’. But not..! When we’re on the ground we can mesure blue at 470 nm. And then when we get on a plane and measure blue we again find it at 470 nm. As expected... But.., it is not the same peak we were looking at on the ground. That peak is now somewhere up in the area of x-rays., and the peak we’re looking at in the plane was down in the red area when we were on the ground. Because light waves are no different than any other waves. They can be red and blue shifted just as any of them can be. Light does not hold a special place in physics. That it does is a totally foolish thought. The public buys it because they believe those who are supposed to know. Those so called gods from the past. Einstein, Newton, et al.. Those who were supposed to actually know what relativity was about. So in the case of light, it is a matter of the frame we and our measuring devices are in. And while many people think there are set speeds to frames, like *earth’s*.., they are in fact very fluid and always changing. Every atom in our body has it’s own constantly changing frame. Every atom is the center of its own universe. Each atoms adjusting it’s operating and aging speed inversely to the slightest difference in it’s movement through the cosmos. See the section on Relativity to know why and how this happens. So when we increased our speed by being on the plane, we slowed our entire aging process. Our brains and perceptions slowed. So we had to look for a lower and longer wavelength to equal our evolved need to see blue at 470 nm. And so as the light waves were blue shifted upward, we did not follow them up as we would with the train whistle. We stayed with our need for wavelength. We found it on the spectrum where the previous red had been shifted and shortened to meet our need to see blue at 470 nm. So we slide up and down the spectrum inversely to changes in our speed through the cosmos. Light does not change for us. It doesn’t know we exist. Much less how fast we’re moving. And of course the same thing appens to the atoms of our measuring devices. Everything stays and what’s called ‘rest’ but in fact there’s a lot of moving going on. And our devices like clocks and light measuring instruments are running slower too and so they see the same as we do with our brains. They will always measure blue at 470 nm and it’s speed as ‘c’... Relativity simply cancels out the Doppler. There is none of that. There was no Big Bang. What Hubble saw was a fluke of light which is explained below.. He thought it was true red shift, indicating that distant galaxies were heading away from Earth. And that it was happening in all directions at once. The discovery was announced but shortly thereafter Hubble realized it was not what was happening. That the idea of the cosmos expanding outward from earth was foolish and he tried in vain to stop the idea of the Big Bang and expansion. But the newspapers had already gotten onto the catchy Big Bang term and the public liked it. So it stayed. The public loves sci-fi you know. :) And so now it’s taught in colleges as mainstream by people who call themselves scientists. The Big Bang always was a dumb idea. Where it happened couldn’t be found, what was there before, what made it happen, how could everything come from nothing. It seems they were meeting at 4:20 pm years and years ago. But there is hope. They have recently introduced the idea of the Big Bounce. Another catchy phrase that the public should love too. It’s where the cosmos has been expanding and contracting forever. At least they finally got the forever part right. But in any case, once the public is over the shock of no Big Bang, I’m sure they’ll be getting rid of the huffin’ and puffin’ too. Sacred cows are hard to kill. It has to be done in stages. What Hubble really discovered is that light was dying as it got to earth. That it was giving the ‘appearance’ of red shift because of that. That shouldn’t have been any big surprise to anyone since we do know we live in a visible ‘bubble’, That the light from the edge of our visible universe can only travel 45 billion miles and then it goes out. And that is the distance to the edge in alll directions. We are in the center of where the expansion would have started. Like maybe we shouldn’t be here..? They finally gave up on trying to eplain that one so to cover that inexplicable idea that the Big Bang did not originate from earth’s locaton, they changed the idea of expansion to inflation. Showing us that on the surface of a baloon none of the worlds, suns, etc. would be in the center. That there was no center. That it happens all over the place at once. But then I thought, what if we let the air out. ? The next step of the Expansion / Inflation saga is that as light reached the end of it’s visible jouney from the edge of our visible universe, the light fluke got worse. The light was dying faster towards the end.., so the red shift was increasing more quickly from most distant galaxies. To solve that problem and save the expansion idea they came up with Dark Energy. A totally unknown and explainable force or source of power that is driving these massive galaxies faster and faster away from us. And intact too.., an amazing feat. Fact is, it’s all hogwash. The cosmos steady state.., always was and always will be. Nothing much changes as far as the delivery system goes. The electrons and the waves they generate travel at their particular rates of speed throughout the cosmos as determined by the energy of their ejection, and not influenced at all by any sense of relativity. They don’t know earth or any other frames exist. The electron’s speed is determined by how much energy is put into its send off. Its speed then determines the highest frequency of the EM spectrum it is able to produce. The amount of blue shifting it can do to it’s pilot wave. The difference between red suns and blue suns for one. The speed and direction of the light source itself will play a part in the electron’s speed but because it can either add or subtract from the send off energy we just ignore it. It’s impossibie to determine either speed accurately anyway. Whatever speed and direction the electrons are given they will continue under straight line inertia until they hit something. And depending on when and where that happens and what that surface is, it produces the particular reaction to the light they are capable of creating. As mentioned above. Reflection, refraction,etc. Having mass explains how light paths can be bent by outside gravity sources. Large bodies in the cosmos can cause what’s called gravitational lensing. Just as what is done with another POV of electromagnetic attraction in the neck of a CRT for the raster to be formed on its screen. And there may be other hindrances along the way. Because there is a very gradual deceleration as they travel. I believe is a counter emf or other payback that happens from continuously creating their pilot wave as they travel. Each inertial frame is presented with the exact same phenomenon of light at these cosmic wide distribution speeds. The electrons riding the universal Aether. The light that is measured in the space ship and on the earth is the same light traveling at the very same speed. The only difference being the aging rates of the atoms in the particular inertial frames viewing it. And so the slowing of the atom bringing on the perception or brain speeds are the true cause of relativity. Not gravity. Gravity is a by product. In a nutshell, individuals in any inertial frame, whether it be on earth, in a space ship, or any other velocity, will simply be seeing the 'section' of the cosmic wide electromagnetic spectrum that fits their particular perception ability; their atom's speed of operation, their velocity induced ‘aging’ speed.... Visible light will appear to humans at the portion of the cosmos spectrum that matches the wavelengths their eyes and minds have evolved to see as visible light. Whatever the section of the cosmic EMR is that is producing light in human eyes will be seen to be the same earth bound frequency range by all measuring devices, atomic clocks, etc. in any frame. The section of the cosmos EMSpectrum being used will be different... That's all that changes... But we don’t see that... No one has in the past either. Newton, Einstein, etc. All in all, it is a pretty sure bet that if you're physically aging slower and your perceptions are slower accordingly, and you want to paint your room blue, your brain is going to want to see a wavelength that relates to blue to your eyes and slowed mind. So you will see blue at a lower peak of the cosmic spectrum than you would if you were aging faster at a slower velocity and lower gravity field. So again, what one sees is the particular red or blue shifted peak of the cosmic electromagnetic spectrum that matches the wavelength that their eyes and brain have evolved to see as blue. Because slower perceptions need longer frequencies to relate to, they use a lower range of frequencies of the overall cosmic spectrum. The cosmic spectrum that is presented to all frames equally. Extending this thinking further, we know that in all frames where people are seeing visible light, there is a frequency range above it that we on earth call x-rays. And while it is known in earth's inertial frame that x-rays are dangerous to humans.., if we were in a slower velocity and gravity, with perceptions running faster, those x-rays would still be dangerous. But in the new frame they would just be seen as the color blue again.., and not be considered dangerous. The reason being with our faster rate of living *and dying* in that new frame they would not affect us quickly enough. And we do have our own healing ability too, from what damage they might do..
That of course brings on the thought that we're being damaged at a very slow rate by the color blue right now. In fact we are. Because it still is another frame's x-rays. You can actually see that damage if you look at the back of your couch that has been facing the picture window for awhile. Or a wall where a picture had been hanging for awhile. Much longer exposure with no self healing ability either. In other words, the entire spectrum, even those frequencies we think don't exist, those below our zero, those that take a decade or more for a single cycle here on earth may be the color blue to some extremely high velocity viewer. It's all relative you know..? This is how it works. I just don't know the limits... If there are any. And in case you puzzle over surfaces reflecting higher or lower peaks according to the frame they’re doing, remember that the paint's molecules do the relativistic contraction and expansion. The size of any surface molecules determine what colors are reflected from it but that size is also inverse to velocity differences..
As the electron particle travels, its forward going wave front is blue shifted to produce the cosmic EMS, including our 'visible' range, when it hits a surface and that EM spectrum is spread out on it.. Some of the spectrum's waves are then reflected to our eyes. THIS then is the when, where, and how the EMS is effectively created and visible frequencies are reflected to our eyes... Or again, when we look directly at a source, the electron comes directly eyeballs. That is the surface the spectrum gets spread on. This is the reason we can't see light leaving us or traveling in any direction other than straight into our eyes.. Other direction's electrons are not hitting our eyes straight on and so to not create any spectrum. A simple verification of this 'straight on' factor is to consider a single point source that two people can see coming at them. Each can see the electrons coming into their own eyes but not the other's I expect if it were otherwise we would all see nothing but a continuous glare of white light all around us. In fact this explains the already long running question as to why it is not that way. But the electrons are still there. Because either person can put their hand in the path going to the other person's eyes and see the reflection from those otherwise invisible precursor particles hitting and lighting the hand itself. The visible frequencies are created on your hand or whatever other surface and sent out in their own circular wave front to everyones eyes. The original incoming visible section of the EM spectrum is normally seen as white as it contains all the colors. But reflections carry only the frequency of the color a particular surface is capable of returning, such as blue at 475 nm. Reflections also tell us the distance the surface is from our eyes by hitting each eye from a slightly different angle. And so with millions or billions of electron particle's wave reflections working together we're able to see the three dimensional room we're in. Not well, but enough for human use. The rest is that, upon arrival, the electrons particles are absorbed into the surfaces they hit, along with all of the non-reflected waves, which degrades that surface over time. So watch what you watch. Here again I'd like to say I'm only human. And that I have no idea of how low or slow, or high and fast the cosmos works. We know many things but I'm sure much more goes on that we earth-bounders can't feel, measure, see, or believe... That an atom in my fingertip can affect atoms in the Andromeda Galaxy gives some idea of this. That such a wide range of frequencies can be brought to us by a particle trying to get through the attractions and obstacles of the cosmos, to travel so far and to have its radiations travel so much further when reflected back additional great distances such as views we can see from mountain tops or that of the moon is mind-boggling. The energy levels expended and the potentials that seem to abound in the cosmos are tremendous, or on the other hand there are those that are immeasurably weak and inconsequential as seen from our POV too. But obviously to the cosmos they are both an equal part of it. Forces that are more invasive and controlling than we not-totally-sentient beings can imagine. As above but reiterated with a little more detail... When first considering that if a *photon* were traveling at us at the speed of light as a particle or whatever they are said to be, it could not form to create a wave that was also traveling at that same speed, while keeping up with the wavefront itself. I quickly determined they could not exist and again alll the reasons are fully explained below. But since electrons cannot travel at that speed it is moot, and we are left with a standard ‘Doppler effect’ situation. The conditions that are described in the image below. Electron doing blue shifting image. Maximum shifting happens in the extreme straight on direction. With the speed of most electrons it normally amounts to somewhere above the visible range. The high end depending on it’s particular speed. And since an electron particle radiates its pilot wave in all directions, once we looked a degree or two away from straight on we saw slightly lower and longer frequencies that had not been blue shifted as much. Those various angles off from straight ahead were not so totally compressed and as the angle away from straight ahead is increased degree by degree, there is less and less blue shifting, allowing lower and lower radiated frequencies to spread out from the center. Picture a line of people standing perpendicular to and equally spaced out from the tracks of a fast approaching train engine. And that when that engine blew it’s whistle the person directly ahead of the train would heard the whistle tone much higher than it actually was. And that each of those people standing further from the tracks would hear slightly lower frequency tones until the furthest may not hear any difference at all. We saw that the angles of radiation from straight ahead to 90 degrees out would contain all the frequencies that could ever be generated in any way imagined or needed, and equally able to be used as such by *any* inertial frame. In other words our earth's entire electromagnetic spectrum *plus*. From the ultimate highest in the forward direction, to the cosmos long frequency just before the 90 degree point.., where that degree goes perpendicular to our field of vision and not toward us at all. What it amounts to, since electrons radiate their pilot wave outward in all directions at once, is that as each electron hits a surface, the entire spectrum comes with it. It spreads itself outward from the center of impact, from highest to lowest frequency. Now relating only to the visible light spectrum portion here, you would see the highest frequency colors hit first, in a circle close around the center, followed by each slower frequency, cycle by cycle, laying down the rest of the circular rainbow of rings moving outward. When seen in graph form, outward going distances for the blue and red frequencies traveling at light speed, vs. an electron's straight on travel is easily understood. The wave length at say 5 degrees off the center line of travel will produce a blue frequency and a wave length coming from say 10 degrees off will produce a red frequency. In addition to the image above I have added a quick drawing of this here. Please excuse the word ‘photon’ wherever it appears in the image. The drawing was done before getting fully away from that, now known to be, totally imagined concept. Please read and replace the word Photon with Electron. Electrons are what are working in the twin slit. Electrons obit their atoms as bits of matter and not a cloud. As described in the chapter on the Atom. When excited and expelled by any source electrons bring with them a ‘pilot wave’. The force of their send off is what determines if their speed is enough to produce visible light or not. But if so, this is what they bring to the slits. They do not come as waves themselves. That’s duality and not science. The experiment can be carried out using the sun, lasers, or even incoherent incandescent light. And they all give basically the same result. Two surfaces are set up one behind the other. The near surface having two side-by-side slits, each just wide enough to pass a vertical column of electrons. The near surface then has a light source applied to it to see what transpires. What does transpire is what those precursor-to-visible light electrons emitted from a source are radiating their pilot waves (de Broglie and others) as they approach a surface, and as described in the main section on Light all their blue shifted pilot waves hit all over that surface and, similar to a train whistle will have a higher pitch to one standing ahead near the track.., and a lower and lower tone for each of those standing at regular distances away from the track, the pilot wave produces a similar spectrum of EM wavelengths. From the highest determined by it’s speed to the lowest. They are all reflected back to the viewer from the front wall.. Everything is normal. Because.., as each precursor to light electron proceed toward the far wall the width of its effective wave-front coverage contracts inward as it’s circular rings of visible color, those which are producing ‘white’ on the back wall, become smaller and smaller. When it is very close to the far wall its radiated circular rainbow of visible light diameter will only encompass the area directly in line with its own slit. So the areas in line with the slits are the last areas to get ‘lighted’ by the incoming electron’s blue-shifted pilot waves, as they shrink down across the wall producing ‘visible’ light. That’s the why of that area being the brightest with only one slit open. So, by arriving at that back wall., every incoming blue shifted spectrum frequency has brushed every visible color wavelength across every molecule on the surface of that back wall until that photon hits and embeds itself into the wall and the width of its visible light spectrum made zero. To reiterate, every molecule on that back wall is wiped with every color of the rainbow by every incoming electron’s pilot wave's blue shifted spectrum as the radiated wave-front contracts from full back wall diameter (width) to near zero diameter, and in line with their respective slits. Each molecule of that back wall area then either reflects, refracts, absorbs, passes, or prism’s the waves, depending on the color and consistency that surface is and meant to be. When the other slit is opened and there are two groups of electrons streaming in and radiating their pilot waves outward. The back panel changes from being fully lighted to showing several pronounced bars of light and dark across its width.... For ease of describing what is happening we will adjust the distance between the wall with the slits and the far wall to produce just five alternating bars of light with the center bar being between the two slits. The bars of course come from the interference pattern expected when two waves cross. But this is often where the experiment ends and we are left in one of the dark areas as to why all this is happening. So here’s the rest of it... Looking at the five vertical bars of light that are formed, the wave peaks that create the two bars in line with the slits are at say an arbitrary level ‘2’ intensity. Ignoring the dark canceled out valleys because we all know why they are so.., the interference induced peaks that also occur on either side of each of the two ‘slit’ bars will each be somewhat dimmer. For instance a level of 1-1/2.., and this is the intensity that will be seen at the two outside bars of the five total. The two similar 1-1/2 level peaks towards the middle between the slits will overlap each other and therefore produce the brightest bar with an intensity total of 3. The above is a typical illustration of a wave interference pattern seen from above... One can relate it to the two slits on the right wall with electrons coming through both and radiating their waves outward, and covering the full width of the left wall... It shows the pattern of mixing that produces the light and dark areas on that wall. You will notice that one of the light areas is between the two wave source slits. Now I’m not even going to try describing all the mixing that will be going on.., with each electron’s blue shifted pilot wave mixing with the ones ahead, behind, above and below with all those various sized circular rainbows of light being projected ahead. The billions and trillions of rainbows of every size being laid down on that far wall at once... I mean it’s very easy to see, with only one slit open, that it will turn out to be white light that is reflected.., except for the extreme outside edges. But I expect it would take a a Cray or two to compute where all the peaks and valleys were at every instant, when the second slit was opened. I might be wrong and I’m certainly not able to visualize a pattern forming as the waves all travel from the two slits to the far wall. But it turns out that they do, upon the last fixed impact point, produce the vertical bars. That is the proven physics description of the Twin Slit Experiement. There's no magic. So it certainly does not prove Duality, Quanta, or anything else. In fact it says that there is not photon quanta. As we look at light coming from the edge of the visible universe we see it red shifted. This is being taken to mean the cosmos is expanding. I too believe there is a more reasonable explanation. So I hope one or two of the others get to read this more logical probable happening.. So the difference in their incoming speed.., being more blue or more red shifted.., gives the same appearance as if the light source was moving away., or moving towards us. When in fact it is not moving at all. Going beyond the fact that photons erroneously indicate the cosmos is expanding.., they are giving the indication it’s expanding faster and faster. That photons cannot generate light forever fits in very nicely with the rest of what is observed in the universe. For one that we are in the middle of a 'visible' portion of the entire universe... As we look out into the cosmos we can see an equal distance in all directions. The first thing that comes to mind other than the absurd idea that we are at the exact center of the entire universe, along with being at at the exact spot where the big bang was supposed to have occurred, but still cannot be found, is that there was no big bang.., and that is simply much more to the universe than we can see. That there is a limit to the distance a photon can travel while still producing a visible and viable frequency. Since we're not really in the center of anything, photons traveling their maximum distance to earth from all directions around us can only mean that we are only able to see THAT portion of the universe and that we are in the center of THAT visible portion only. A totally subjective situation... Because, perhaps trillions and trillions of miles beyond the edge of our visible universe in any direction, may well be groups of other life form cosmologists who see themselves in the center of their own visible portions of the universe. So it all seems to point to the fact that there may be bubbles of visible universes for those who have evolved the ability to see in the same manner we have. Is that totally weird idea of multiple universes and dimensions hiding in there somewhere.? lol Maybe those who use calculations based on ‘t’ have stumbled onto an abstracted version of what is truly happening in our much larger than will ever be known physical universe. It seems so... A similar concept of multiple bubble universes.., but brought about more realistically with the math and concepts based on the characteristics of physical atoms and particles., instead of imagined time stretching, folding, forming worm holes, and whatever. Another indication that light comes to us via a particle with mass and can therefore be deflected by gravity is the well known ‘Gravity Lens’. Many examples exist in the cosmos. When electrons are coming from a distant source that is behind a planet blocking Earth's view of it. We can see that the planet's gravity field bends some of those more outward bound photons around itself to the direction of Earth. So the Earth is then able to see a very distorted image of that galaxy or star... At least enough to know it's there. The electrons generating the light waves are able to be attracted and bent around the outside edge of the planet. In a perfect situation, with the distant galaxy, planet, and observer all being in a straight line, the light from the galaxy will be seen to form a thin circle of light around the blocking planet. But in most cases, deflected light from distant galaxies will be seen as arcs of various lengths and brightness around the planet. It is not another force bending light... It is gravity redirecting physical mass. The name given as the reason one sees an increasing red shift the further out one looks.... An observation that gives the impression the cosmos is not only expanding but doing so at an ever increasing rate. That galaxies are speeding away from us faster and faster. That some day the cosmos will be nothing but black to us. :/ So there just has to be something out there doing that..? I certainly expect it can be explained by normal and much less sensational factors of a non-expanding cosmos. As already mentioned.., it’s obvious that electrons do lose the ability to produce light after traveling that 45 billion years from the edge of our visible universe. And it’s likely they simply slow somewhat over that distance.., and likely it’s exponential or at least more quickly towards the end of their ability to create light. Now they say that Dark Energy suddenly started to expand the universe faster and faster at a point about six or seven billion years ago. What a coincidence. So it seems to be the point where these electrons do start to degrade more quickly... So I would hazard a guess now.., that it really isn’t any magical Dark Energy.., but that these messenger photons, which are electrons.., which have been producing light over the total distance from the edge of the visible universe.., likely losing that ability in a linear fashion.., but after they travel in from the outer edges of the visible universe to a point that’s said to be that distance out in ‘light years’.., the end of their ability to produce light starts to advance more quickly, before stopping altogether. We have already laid out the very likely scenario where the cosmos is not expanding, so a faster and faster ‘steady-state’ is an oxymoron. It seems this Dark Energy ‘force’ is another nothing. Another illusion to support the Einstein religion. The background hiss or white noise that is thought or wished be some to be left over residue or echo from the big bang is not likely. Because there was no Big Bang in the first place. The hiss is much, much more likely to be coming from all the electron’s outgoing pilot wavelengths than never quite made it to a surface to become useful as visible light or any of the other usable frequencies of the spectrum we know and love. And it would include the electrons that have come from beyond the visible universe with their spectrum now below the visible. Basically, as suggested in another area above, that it comes from the totality of all useless frequencies that messenger photons have left behind them as they travel. In other words those radiations that are being sent back to us after the electrons have passed us in their travels. Both being one in the same. To this point we have discussed the means by which electrons lay down a continuous ‘vanilla’ spectrum... Along with the explanation of the twin slit experiment. Electron’s with their blue shifted pilot waves passing through the slits to spread their generated EMS against the back wall. As far as I understand it, Spectroscopy has the still not visible electron’s pilot waves striking the surface of a telescope lens or other focusing ‘prism’ first.... This creates the waves of the visible spectrum, which are focused to pass through a slit to isolate them from ambient light... The waves are then focused into a beam that is passed through a collimator to allign the waves even further. Still white light, the collimated spectrum is then sent to a refraction grating which spreads them into the various wave lengths, the wave’s spectrum of colors, over the area to be studied or recorded. Until this point I have been talking only about pilot ‘sine’ waves being emitted by electrons. But spectroscopy shows that they are not that pure.. There are various amplitudes, spikes, etc. 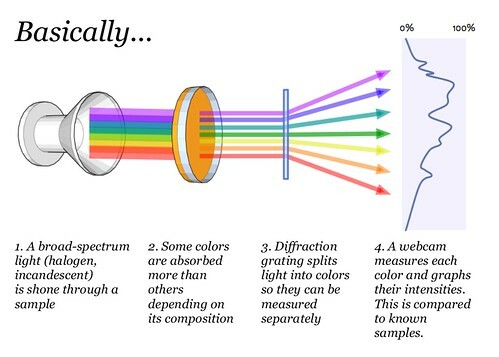 throughout the spectrum of color laid out by spectroscopy. Points along the original pilot waves that are obviously caused by the elements and molecules of the light source that they came from. The exact reasons are beyond me at this point but here is one possiblity. The native frequency... That which is blue shifted to the cosmic EM spectrum, depends on the element they came from. When a stream of electron pilot waves are presented to a spectroscope, there would be electrons coming from each of the elements in the source and each would have it’s own waveform, spikes or whatever.., which in turn would be combined with the other elemental pilot waves. Combustion itself seems to be invisible. Combustion ‘flames’ cannot be seen when coming from some highly volatile fuels such as methanol and ether.. I know nothing of chemistry or reactions causing combustion other than it usually needs external oxygen. But I’m sure its heat and energy affect the speed of the electrons that are being emitted. I haven’t tried to figure that out, only where the ‘visible’ flames come from. With more ‘normal’ fires burning carbon based fuels and such, the electrons are produced and send outward. They then hit and then reflect, refract, filter and/or prism their blue shifted pilot waves through and from the hot combustion gases as they rise upwards, mixing with the cooler air around them as they do. This motion of the gases gives them their flickering wispy look..